With college basketball's March Madness dominating the U.S. hoops scene, it may have escaped some that the Philadelphia 76ers are on the verge of tying and possibly breaking the NBA record for longest losing streak. As shown on the Wikipedia's list of the longest NBA losing streaks, Philadelphia has been "deep-sixed" 25 straight times during its current streak, one loss shy of the record 26 consecutive defeats suffered by the 2010–11 Cleveland Cavaliers. On paper this is a bad deal for the Sixers, but they have no intention on trying to win games. The team is tanking like no other in hopes of winning the 2014 NBA Draft Lottery. Getting back to tonight's game, Carl Bialik, the former Wall Street Journal "Numbers Guy" who now writes for the newly relaunched FiveThirtyEight, calculates only a 4% chance of the 76ers winning. As the Sixers' losing streak was building in recent weeks, I began trying to come up with a statistical angle on it. One line of thinking is that, contrary to the idea of other teams taking the struggling team lightly, opponents will play even harder against a team in free-fall in an attempt to avoid being "that team" -- the one against whom the losing streak ended. Thus, for Philly, ending its losing streak against a strong team such as Houston, on the road no less, would seem unlikely. The question then came to me: what is the profile of an opposing squad against which a team ends its long losing streak? Presumably, such an opponent is likely to be a bad team. If you lose to a team that has lost its last 20 or 25 games, you can't be that good yourself. Ultimately, though, it's an empirical question. I consulted the aforementioned Wikipedia list of the longest losing streaks in NBA history. 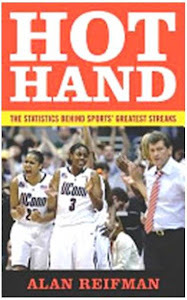 The list included 30 losing streaks: one each of 26, 25, and 24 straight losses, three of length 23, one of 21 games, four of length 20, seven of length 19, four of length 18, and eight 17-game losing streaks. The list also included the date and opponent when the streak ended. I then went to Basketball Reference, which has extensive season logs for all teams in NBA history. For example, seeing on the Wikipedia list that the 2010-11 Cleveland Cavaliers (holder of the league record) ended their 26-game losing streak on February 11, 2011 against the L.A. Clippers, I could go to the Clippers' log for that season and see that they brought a 20-32 (.385) record into the game with the Cavs. Taking advantage of this weak opposition, Cleveland ended its losing streak. I tried to make the same inquiry into the ending of all 30 of the NBA's longest losing streaks. However, streaks that carried over from one season to the next often ended early the next season, when teams may have played only a few games. To ensure relatively large samples of games, therefore, I limited my analysis to situations in which teams against whom a long losing streak ended had played at least 20 games during the season. There were 18 such situations, which I depict in the following graph. Unless you have some unbelievably strong eyesight, you'll want to click on the graphic to enlarge it. 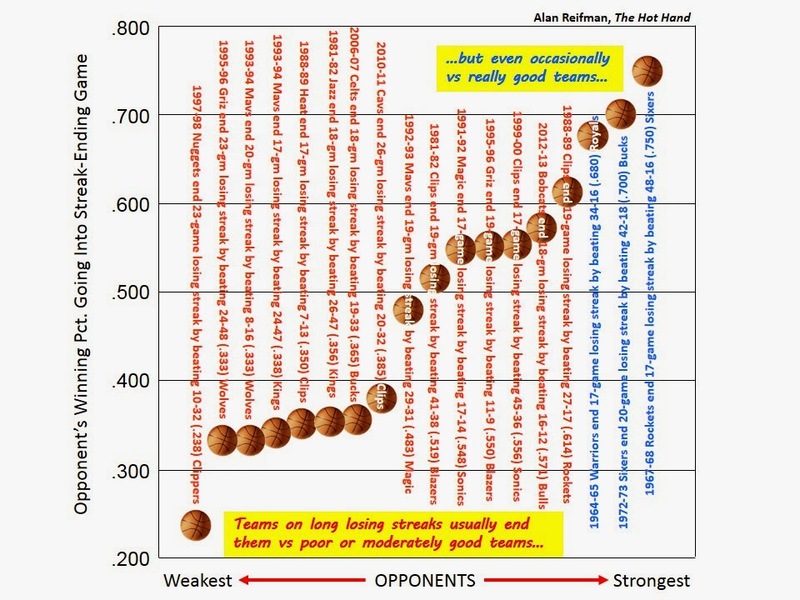 The data points, represented by little basketballs, are arranged left-to-right from lowest to highest opponents' winning percentages entering games in which long losing streaks ended. A description of each streak-ending appears vertically by each ball. On the far left, the game in question is one in which the 1997-98 Denver Nuggets ended their 23-game losing streak by beating a 10-32 (.238) Clippers outfit. In another seven games, a team ended a long losing streak by beating a team whose winning percentage was in the .300's entering the game. The 1964-65 then-San Francisco Warriors ended their 17-game losing streak by beating the 34-16 (.680) Cincinnati Royals (now the Sacramento Kings). The 1972-73 Sixers, a squad that won only nine games all season, snapped their 20-game losing streak by beating the 42-18 (.700) Milwaukee Bucks. This was during the Kareem Abdul-Jabbar era in Milwaukee, in which the Bucks won the 1971 NBA title and lost a seven-game final in 1974. Kareem did miss the fourth quarter of the Sixers' streak-busting game, due to a back injury. The 1967-68 then-San Diego Rockets ended their 17-game losing streak by beating the 48-16 (.750) 76ers. This was toward the end of Wilt Chamberlain's time in Philly, with the Sixers having won the 1967 NBA title. So yes, there is some precedent for teams ending their long losing streaks against opposing teams with winning percentages in the vicinity of .700. Perhaps you noticed another pattern, though. All three instances of teams ending their losing streaks against such lofty opposition occurred more than 40 years ago! It may be just a coincidence. However, another possibility is that the greater scrutiny of sports contests now than in the past (e.g., via the Internet, 24-hour sports cable networks, and radio talk shows) has made the top teams extra sensitive to becoming "that team" when they face an opponent on a long losing streak. UPDATE: After losing to Houston to tie the NBA record of 26 straight losses, the 76ers beat Detroit to end the streak.